UnitedHealth (NYSE: UNH) reported strong second-quarter results, as its earnings per share beat market expectations and revenue was about in line. The company’s revenues grew by 12.1% year-over-year to $56.1 billion, largely driven by solid growth in both the UnitedHealthcare and Optum segments. In the UnitedHealthcare segment, the number of people served internationally saw an impressive 46.5% year-over-year increase to over 6 million. Also, growth in customers served for both Medicaid and Medicare Advantage plans drove 12.4% growth in UnitedHealthcare revenue. Within Optum, the OptumHealth business continued to deliver solid results on the back of growth in consumers served via OptumCare. The strong second quarter results prompted the company to increase its full-year EPS guidance to $12.50 to $12.75. Despite the solid results, the company’s stock price dipped by 2.6% on the day of the earnings release. So, why the dip? 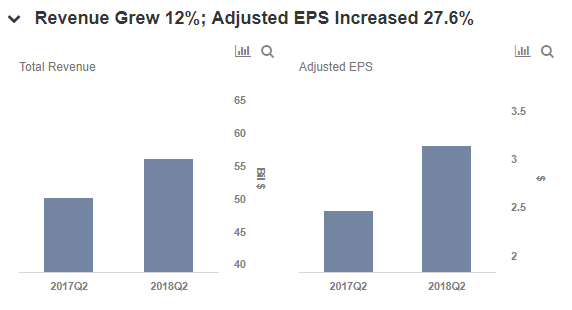 This is likely due to the fact that the company’s higher EPS was largely driven by lower corporate tax rates rather than operational improvements. Furthermore, the company reported higher-than-expected medical costs. 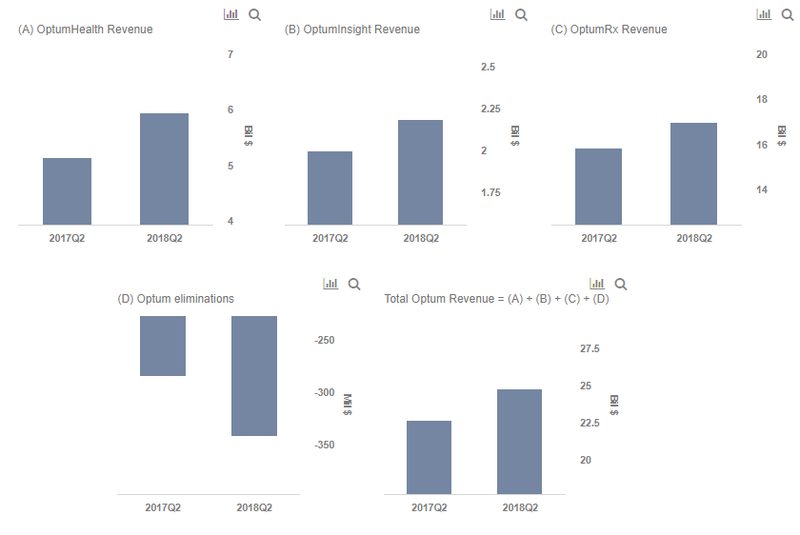 As you can see in the chart below, while the operating margin for the company remained stable, the net margin was boosted due to the aforementioned factors. That said, we are positive about the company’s future outlook and maintain a $265 price estimate for UnitedHealth, which is ahead of the current market price. Our interactive dashboard for UnitedHealth’s earnings details our forecasts and estimates for the company. Below we outline the key takeaways from UnitedHealth’s Q2. 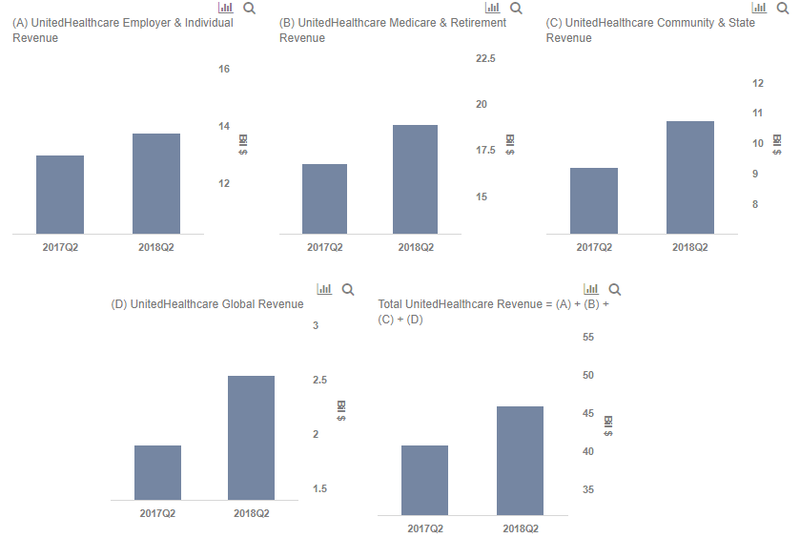 UnitedHealthcare revenues grew 12.4% to $45.8 billion as all the businesses within the segment performed well. The number of people served by Medicare Advantage grew by almost 10.4% year-over-year. Overall, the UnitedHealthcare business added 2.2 million customers in the last 12 months. Meanwhile, the company seems to have benefited from the acquisition of Chile’s Banmedica. Also, advancements in technology, product design, and consumer experience have led to positive outcomes in Brazil. As a result, these two factors have driven an impressive 33.5% growth in the company’s global business. However, the overall growth was slightly offset by the weak performance of the fee-based commercial group, which experienced minor attrition. In Optum – OptumRx, the largest contributor to Optum’s revenues, continued to perform strongly. The number of scripts grew by 3.1% to 332 million. However, OptumHealth saw the biggest jump. Revenue from this business grew by 16% on the back of a 7% increase in the number of people served and a 12% increase in revenue per person. This was largely due to OptumCare, which has found unprecedented success. Meanwhile, solutions such as Rally Care and PreCheck MyScript continue to engage customers and doctors. UNH’s Medicare & Retirement business has seen solid results on the back of Medicare Advantage plans. The number of people that the company serves via public and senior plans has been on a strong run for a while now, and we expect this trend to continue in the near term as the population of Medicare beneficiaries is slated to grow in the coming years. Meanwhile, the plan to serve about 80% of its Medicare Advantage seniors by 4-star rated plans in 2019, along with consumer-centric products and benefits such as value-based care, should continue to improve efficiency and drive customer satisfaction. In the global business, UnitedHealth’s efforts to improve the business performance of its Brazilian acquisition, Amil, seems to be a step in the right direction. Advancements in technology, consumer experience and product design, and investments in primary care delivery have driven growth, which will likely continue in the upcoming quarter. OptumCare, a health service delivery business, is seeing strong growth and we expect this trend to continue in the upcoming quarter. This will be driven by growth in care delivery, health financial services, and the continued use of analytics that will help the business penetrate into different markets. Net Promoter Score (NPS), a management tool that can be used to gauge customers’ overall satisfaction and loyalty, is about 80 for the business, which exhibits the company’s excellent customer-centric approach. The reason for this success has been solutions such as Rally Care and PreCheck MyScript, which deliver physicians search and drive price transparency, thereby engaging more customers. We expect the company to generate about $57.2 billion in revenue in the third quarter. Furthermore, we expect UnitedHealth’s net margin to slightly improve in the near term due to robust cost management efforts and lower tax rates. We forecast net income of about $3.3 billion, or EPS of about $3.39.